The OneTouch® Ultra®2 Blood Glucose System is a fast, gentle, and simple way to see the effects of food on your blood sugar levels. We know diabetes can be difficult to understand and manage. The right products and services can help make life with diabetes just a little bit easier. 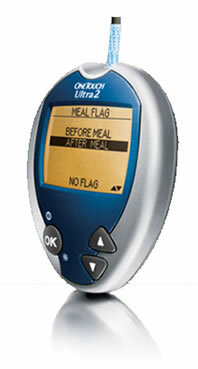 We designed this product to make testing easy and to help you manage your diabetes. You can use the meter for fast and simple tests. You can also use it to record information to go with your results. View before- and after-meal averages. See the impact of your food choices. See the effects of food and portion choices over time.